Fluke has announced two new true-rms logging multimeters. These incorporate advanced data logging and TrendCapture to help engineers and technicians track down problems faster than before, with TrendCapture also helping preventive and predictive maintenance. An extra-large screen shows results graphically, backed by an enhanced user interface with on-board help (i-info key) available in seven languages, and soft-key interface. The Fluke 287 high-accuracy Electronics Logging Multimeter quickly documents electrical performance and shows trend information. The Fluke 289 Industrial Logging Multimeter has important additional features including Lo-Pass filter, and Lo-ohms and Lo-impedance measurement ranges. It diagnoses problems in electronics, plant automation, power distribution and electromechanical equipment. Both meters can log multiple sessions unattended in the field, with logged readings being reviewed without a PC, and both come with a lifetime warranty. The two Fluke instruments feature a large 50,000-count, 3-1/2 inch quarter-VGA dot matrix display that can show multiple measurement sets. The screen also features a white backlight, and displays context-sensitive on-board help screens. The instrument setup is customizable to save time and increase productivity. Multiple save options and automatic time stamping allow convenient recall of field measurements, while a PC interface ensures easy data transfer. Optional FlukeView® Forms PC software enables users to document, store and analyze readings, and then convert them into professional-looking reports. Fluke’s new meters store up to 10,000 readings. For accurate measurement on non-linear signals, they can measure true-rms voltage and current. They have a 50 mF capacitance range, and measure up to 10 A (or 20 A for 30 seconds). Peak capture can record transients as fast as 250 microseconds. A relative mode removes test lead resistance from low ohms or capacitance measurements. Both meters have a battery life of 200 hours. 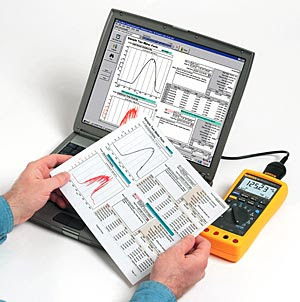 The Fluke 287 has an ac bandwidth of 100 kHz, and a 0.025% basic dc accuracy. It includes a temperature function. The Fluke 289 has a two-terminal 50-ohm range with 1 milliohm resolution and 10 mA source current, useful for measuring and comparing differences in motor winding or contact resistance. A Lo-Pass filter ensures accurate voltage and frequency measurements on adjustable speed motor drives and other electrically noisy equipment. A LoZ Volts function eliminates ghost voltages, and can test for live power. The meter withstands hazardous 8,000 V spikes caused by load switching and faults on industrial circuits, and complies with second edition IEC and ANSI electrical safety standards.